[THE INVESTOR] Samsung Electronics president and mobile chief Koh Dong-jin on July 13 showed confidence about the company’s upcoming launch of the Galaxy Note 7 on Aug. 2. “We have improved ‘note’ functions this time, upgrading software for user convenience,” Koh told reporters in Seoul. 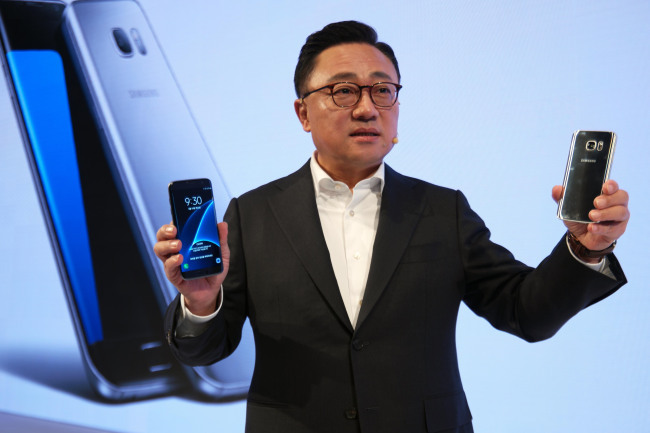 Samsung Electronics mobile chief Koh Dong-jin speaks at the Galaxy S7 unpack event held in Barcelona in February. He is scheduled to take the stage to unveil the new Note phablet at an unpack event in New York. Since the predecessor Note 5, the company has held the event a month before its archrival Apple’s iPhone launch that usually comes in September. The latest Note is the sixth version, but it has been named “7” in order to align its Galaxy S families. In its earnings guidance announced on July 7, Samsung forecast its second-quarter operating income to reach 8.1 trillion won (US$6.90 billion), the best quarterly earnings in two years.